Andy Richter remembers asset management in the City of Colorado Springs over a decade ago: it was a resource-intensive process, laden with a paper trail. But, after implementing Cartegraph’s municipal asset management software in 2005, going paperless in the field has led to nearly a $2.5 million return on investment. In the last few years, the City of Colorado Springs saw several natural disasters, including two major fires and several flood events. Across several divisions, the city realized it had big gaps in government asset management, especially when recouping from devastating events. The traffic engineering department wanted an effective solution to record asset conditions and paint an aggregate picture of damages. For example, the division needed a system to track information and easily create reports to bill for damaged signs and guardrails. However, Richter felt the team was leaving a cumbersome paper trail and wasting time with manual government asset management methods. After implementing Cartegraph, the traffic engineering department began using data-driven technology to track infrastructure assets that had been badly damaged during disasters. This allowed them to justify costs to FEMA, and bring restitution back into their city funding. “Without the technology, it’s almost impossible to power all of that information,” says Richter. Watch how the City of Colorado Springs uses Cartegraph to recoup the cost of damaged infrastructure, increase workflow efficiency, and track resources for FEMA related events. Beyond restoration, the department wanted to take its public works asset management a step further. Richter saw an opportunity to increase productivity by combining asset data with work requests—to utilize one smart, efficient system that regulated itself. "We really wanted to blend in the requests and create an ‘electronic thread’ through the process of maintenance activities, and have it tied directly to the asset,” he says. Between automation and linear referencing systems the department could now look at assets with the use of base maps, meaning each crew no longer needed an electronic device to track GPS coordinates. The traffic department set up a citizen-facing program called “Cone Zones” to alert citizens of public roadwork in their area. They fed data from these zones directly into ArcGIS Online, populating a map for citizens to view online. “We’re going wireless in the field and taking the paper process out of the equation,” says Richter. As Cartegraph's capabilities spread through public works, the team realized there was something contagious about their high-performance data. Soon, other divisions noticed increased efficiencies and sought to replicate them. Additional divisions began adopting similar asset management processes, including the forestry department, and parks and recreation. Today, 10 out of 17 public works departments in Colorado Springs use Cartegraph, and they’ve seen large efficiencies across the board. 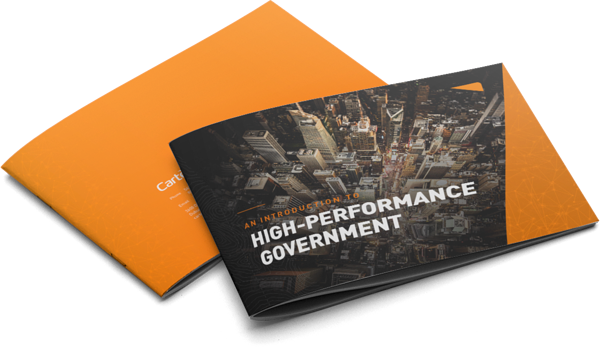 Specifically, they’ve been able to eliminate steps in workflow processes—just one example of how Colorado Spring uses Cartegraph to become a high-performance government. In the traffic engineering workflow alone, they’ve utilized digitized data and asset reporting to remove five inefficient steps and increase productivity. Ready to become more effective and efficient like Colorado Springs?